Ah, this is the life of Riley. 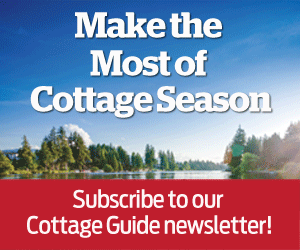 At the cottage — no worries, no troubles, no cares. But plenty of trees, not to mention a view onto the lake, where, thankfully, the kids keep themselves amused tearing in and out of the water. Happy despite blackflies and belly flops, content despite the squabbling. Back in the kitchen, your husband’s busy making potato salad and drinking Malbec. Uncle Albert, helper of all trades, is swearing up a storm — he has cut his finger topping and tailing green beans. Your sister has just put her raspberry crème fraîche puff in the undependable oven. Meanwhile, your mother, out on the dock deep into Alan Furst’s latest WWII thriller, is blissfully unaware of everything. And if it weren’t for those random pieces of Where’s Waldo? jigsaw irritating you … If it weren’t for the 30-year-old tire swing … If it weren’t for ye olde wooden sign hanging at the driveway proclaiming cottage ownership … If it weren’t for all that, you’d almost believe you were on the edge of civilization. But no, here you are at the barbecue, wanting for nothing, neither meat nor bread. And more importantly, neither mustard nor chutney. Here are three locally made condiments that will add pizzazz to everything you throw on the grill this summer. Marinate your Cornish hen in lime zest and juice. Barbecue. Serve with Aunt Thelma’s Peppered Pineapple Preserve, bright with flavour and a bit of bite. Ottawa’s Steve Daigle, owner of Aunt Thelma’s, chops up fresh pineapple for this rare treat. He even knows the farmer in Jamaica who grows his Scotch bonnet peppers. $6.99 for 270 g. Seed to Sausage General Store, 729 Gladstone Ave., 613-422-5202. Aunt Thelma’s Peppered Pineapple Preserve is bright with flavour and a bit of bite. “Something happens to the taste buds. It sticks,” says John Lubrun, maker of hot sauces at Chamomile Desjardins. Lubrun comes from St. Lucia in the Caribbean, so it makes sense to call his hottest hot sauce St. Lucia on My Mind (it’s even spicier than sriracha). Give some life to that rib steak of yours! $8.50 for 5 oz. Life of Pie, 1134 Bank St., 613-693-1853. Chef Justin Faubert doesn’t call his caramelized onions a jam for nothing. 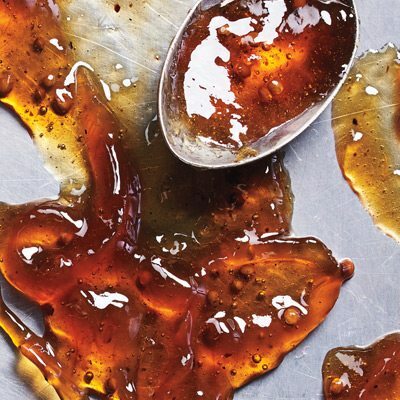 Pectin, lemon juice, and sugar all play their part in this Thyme and Again conserve. Faubert has heard tell of some smearing it over a roasting squash, but in cottage country, it’s burgers all the way. Tell me. Are you addicted yet? $7.75 for 314 mL. Thyme & Again, 1255 Wellington St. W., 613-722-6277. 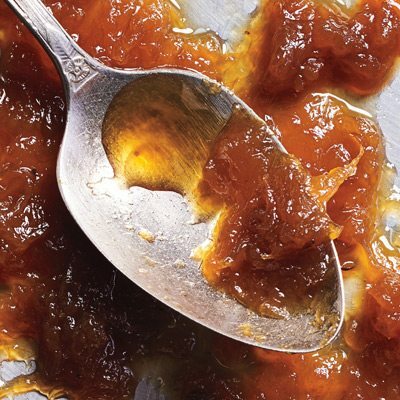 Before the end of grilling season, you’ll be addicted to chef Justin Faubert’s Caramelized Onion Jam.